Manokwari is a beautiful city in West Papua province of the Republic of Indonesia. It is also a great destination for visitors who are nature lovers. 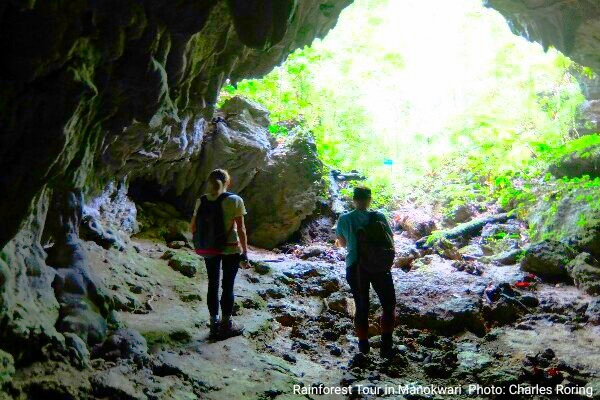 There are a lot of activities in Manokwari which tourists can do to enjoy the beauty of nature and see the wealth of its biodiversity. Tourists can go snorkeling, birdwatching, cycling and even playing basketball and jogging. 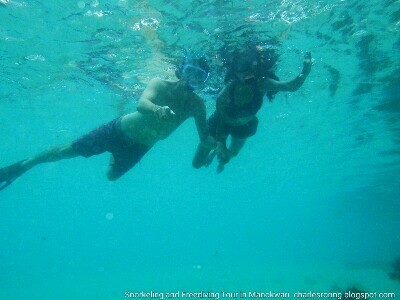 Snorkeling is a favorite marine sport. There are several spots for snorkeling in this regency which tourists can visit such as Mansinam and Lemon islands, Lampu Senen spots (which are the light posts that are located across from the harbor of Manokwari to help ships navigate through the reef), Pasir Putih beach and etc. 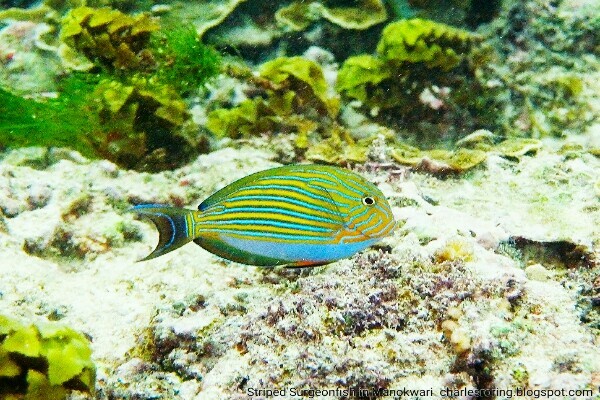 While enjoying snorkeling, visitors can see a lot of species of fish such as Striped Surgeonfish, Convict Surgeonfish, Wrasse, Rabbitfish, Grouper, Butterflyfish, Moorish Idol, and Anemonefish. These fish can easily be seen at depths between one and a half meters to fifteen meters. Snorkelers need to freedive if they want to see fish and other marine animals in deeper waters. 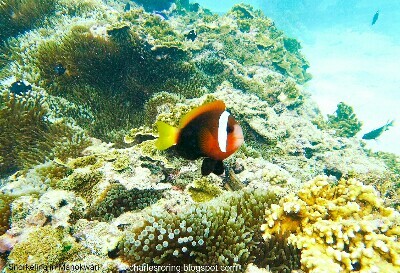 Anemonefish is very interesting among snorkelers. They live in anemone colony that protects them from other predator. At the beach of Mansinam, Pink Anemonefish (Amphiprion perideraion) is the one that visitors can mostly see. 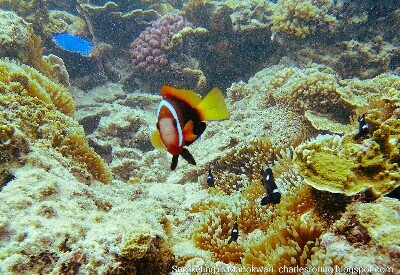 In north coast reef of Manokwari, it is the Red and Black Anemonefish (Amphiprion melanopus) that is common in the coral reef. 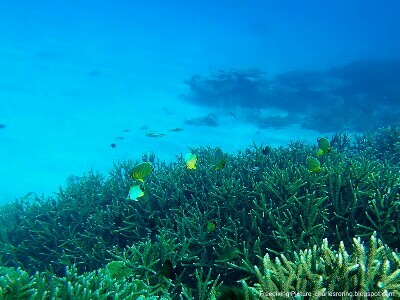 When we do snorkeling over pristine coral reef, we will see various kinds of corals both the hard and the soft ones. We will also see tropical fish that are colorful. To take pictures of the fish, we need a good underwater camera. I use Nikon W300 and Fujifilm XQ2 that is put inside a waterproof case. In the past I used an action camera Brica BPro5 Alpha Edition. Taking pictures underwater is more difficult than taking pictures on land. Based on my personal experience, when I wanted to take pictures of anemonefish that are shown in this page, I had to dive to a depth of around 2 to 3 meters. I was wearing swimsuit, snorkeling mask, and fins. I also held my Fujifilm XQ2. It seemed easy but I had to resist the buoyant force that was trying to bring me back to the surface of the sea. I also had to keep my body as stable as possible when taking pictures or videos. There were waves, and currents that pushed my body. Because my right hand is the one that would press the shutter button. My left hand would be the one that was holding rock on the seabed. My whole body was floating in the water when I shot the fish and coral reef with my camera. In addition to snorkeling, I also organise tours to rainforest. Visitors could enjoy easy walk along the path to see millipede, butterflies, lizards. Sometimes, snake can also be seen in the forest. Tourists must wear hiking shoes, apply insect repellent lotion, and bring flash. Bringing binoculars is also recommended for tourists who like birdwatching. I use 10×42 mm Visionking roof prism binoculars. Visitors could bring any brands that have got good optics for watching birds. A camera with super zoom lens such as Nikon P1000 is good for birding. The rainforest that is near the city is the natural habitat of sunbird, Sulphur-crested Cockatoo, Hooded Butcherbird, Helmetted Friarbird, Spangled Drongo, and etc. There is also natural cave which we can explore. For this purpose, we need a flash light. Inside the cave, there are stalactites and stalagmites. Bats, lizard, toads, and sometimes snake can be seen too. As a tourist guides, I have got 2 sets of snorkeling equipments which I can lend to tourists. However, I am not sure if they are suitable and fit on their faces and feet. Where is Manokwari and how to get there? In the map, Manokwari is located in the Vogelkop region of West Papua province of Indonesia. This small coastal city is a nice destination for tourists who like snorkeling, sightseeing, hiking, and rainforest tour. To reach the city, visitors need to fly from their country to Jakarta (the capital of Indonesia). 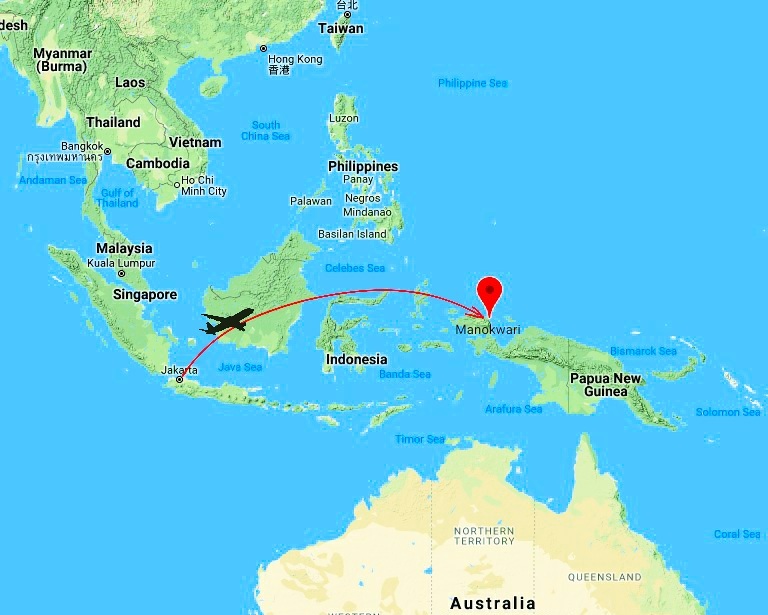 After that, the trip can be continued by taking a flight to Manokwari. Airlines such as Garuda, Sriwijaya, Lion Air, and Batik Air have got regular daily flights. There are hotels which tourists can choose to stay from the more afforable ones such as Ariestom Hotel, and Mansinam Beach Hotel to more expensive ones such as Swissbel Hotel and Aston Niu Hotel. Upon special request, I can organize additional activities for visitors who want to also see other parts of Manolwari city. For instance, we can go hiking in the forest to see tropical trees, and shrub plants as well as insects, birds and reptiles that live in it. We could also do sightseeing tour to the suburban area of Manokwari to see villages and how local people live in their daily life. We can also visit local Papuan artists who make handicrafts from pandanus leaves, and carvings made of wood. These products can become very good souvenirs. If you are interested in taking a snorkeling tour in Manokwari city or other parts of West Papua and want me (Charles Roring) to organize your trip, please, contact me by email to: peace4wp@gmail.com or by whatsapp to: +6281332245180.